FJR6 UK, The Green Devils of Carentan and 9/FJR6 Ireland recently attended the War and Peace Show, Beltring , UK and were honoured to welcome Wolf Schulze again. Wolf arrived with his son John and was attired in his replica uniform. Wolf quickly dispensed with the mobility scooter we had hired for him and switched to a more familiar mode of transport of BMW combination. After an inspection he joined us for refreshments and shared a beer or two! Last edited by jerry on Fri Jul 29, 2011 6:41 am, edited 1 time in total. Hanging up my Knochensack for now, it's been a good war! Again an honour to meet the man! Nice pic of him having a 'Spaten' moment, in preference to my coffee! Herr Werner, one of the nicest blokes you could ever meet! Egyptian Kings packing their things!! I keep this picture to keep my hate strong! Great to see Wolf and everyone else looking so well! Really missing you all! By the way who does the Bolex Camera on the tripod belong too, it looks great! Fotos für Presse und Propaganda. 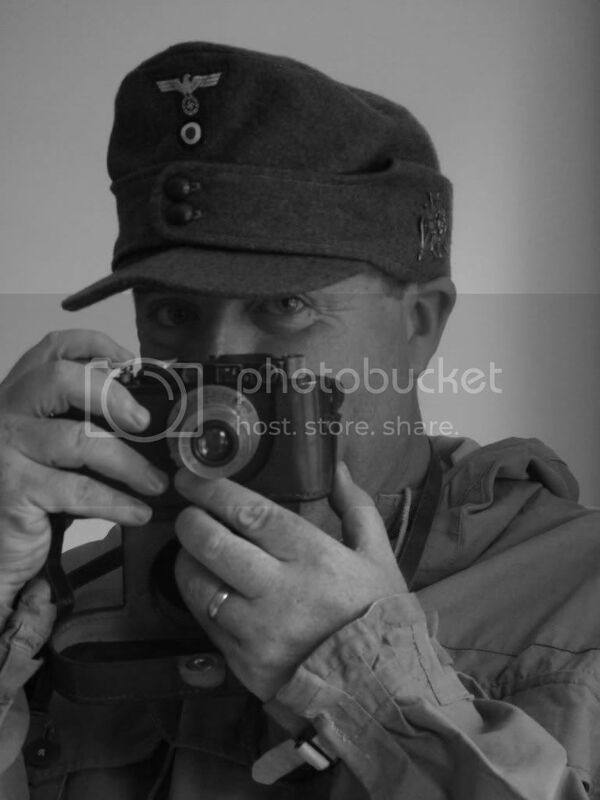 The owner of the camera is Obergefreiter Mark Wehner. The motor is in working order and he hopes to have it fully functioning next year. Thanks Jerry! Thought it might be Mark's! I have a 1942 Bolex H16...they are such great cameras! Hope you are well and that blanket I sold to you is keeping you warm! ...... I also hope that you did not throw any hot water over anyone this year! Paul, all is well thank you. I was requested to boil water at a safe distance at Beltring.... preferably Paddock Wood, some three miles away. I saw pictures from him last year. It is with much sadness to say Wolf passed away last week. Wolf left us on Thursday 21/04/2016 at his nursing home in Kent. He had been suffering from Alzheimer's for some time and had become very frail and succumbed to malnutrition in his final days. His wife Mavis had passed away last year, 17/04/2015. Wolf would have been 92 tomorrow. The funeral is on Friday 20th May 2016, 0945 hrs at Medway Crematorium, Robin Hood Ln, Chatham, Kent ME5 9QU. I have spoken to a friend of the family who states it would be nice to see any of the re enacting community who wish to attend. I had visited both Mavis and Wolf on many occasions and had the pleasure to take this fine gentleman out from time to time. He was a man of few words but always astute and never afraid to rebuff you if he felt your historical knowledge was letting you down. He had written his memoirs which his wife had two bound copies produced for his sons. I was loaned one and it made fascinating reading. He thought no one would be interested!! Last edited by jerry on Sat Oct 15, 2016 8:08 pm, edited 1 time in total. Sad news , that another veteran has passed away . It seems , however, that you and your group took a real interest in this man , and I'm sure made his latter years more enjoyable. Fascinating to see him in his reproduction uniform - has this happened before ? I doubt it . It is interesting that his wife had his memoirs bound . Are there any plans to have them published ? Apart from being of obvious historical interest to so many, it would be a fitting memorial . We were honoured to have known Wolf and it was always a pleasure to have him in our company. Wolf was thrilled at the prospect of having his own replica uniform which we had badged to replicate his rank at the end of his service. There are no plans to publish his memoirs as they were initially produced as keepsakes for his two sons, John and Michael. I did suggest some time ago that there may be interest from a wider audience, which at the time was met with surprise. I may now re visit this idea now that we have lost Wolf, and as you suggest would make a fitting memorial. Thank you jerry, keep us updated on any progress. Wolf had his farewell send off today with a small gathering of family and friends. His son John had managed to persuade the Crematorium to play " Ich Hatt Einen Kameraden" as the congregation entered. It was a very moving and appropriate choice for the man. There was a service at his local church afterwards and a montage of his life was shown, including a nice photo of Wolf sitting with Feldwebel Milsche (Steve Middleton) on his motorcycle sidecar taken at The War and Peace Show, Beltring. John was grateful for all that our group had done for Wolf in the past, especially getting him involved in something that had such a profound effect on his life. I was repeatedly introduced as 'One of the reenactors' and subsequently humbled by the thankfulness from people who knew what a pleasure Wolf had had when we had taken him to various events and getting him involved. One overriding comment made was that by being accepted for what he had represented Wolf was able to overcome to a degree, some of the horrors and demons that had plagued him after he had returned to civilian life. For that, as a group we are honoured. As re enactors we had made a veteran deeply proud and not in any way ashamed or embarrassed for what he had symbolised. Wolf you will be missed.